Nautical charts of the Maine coast were first produced in the late 1860s. Since then, evolving technology has led to increasingly detailed knowledge of the ocean bottom. This couple moved to Maine after 9/11 and built their dream home themselves over seven years. The result looks like an English country cottage. French & Webb’s new FW39 Webfoot is a 39’ cold-molded powerboat with a hull form reminiscent of the Maine lobsterboat and "sailorly" touches throughout. The new Back Cove 32 is both practical and elegant. Maine Cat’s latest catamaran is light and strong at 38 feet, thanks to the company’s unique thermoformed-core build process. Hamlin Marine’s new Edendriver 17 combines practical downeast character with South Carolina elegance. The 28-foot-long Shanty Cat features a small house on a stable catamaran hull. A double-ended sailboat, inspired by K. Aage Nielsen, designed by Joel White, and completed by Brooklin Boat Yard. Annual Christmas Bird Counts promote science, camaraderie, and conservation worldwide. Rare birds and behavior have been a hallmark of the event in Rockland, Maine. Stop by Bar Harbor artist Melita Westerlund’s warehouse studio and you will find her wearing industrial protective gear and wielding industrial power tools. Her final product is far from industrial, though. There is only one person in the United States who builds replicas of historic bassoons. She lives in Maine with her partner in a former cannery that they have turned into an avant-garde music venue. From cozy hibernation to bundled exploration, Rob McCall offers thoughts for how to pass the deep winter months. Two vintage postcards from Boothbay Harbor, excerpted from the book Maine on Glass: The Early Twentieth Century in Glass Plate Photography. Alexander Sanger, a summer resident of North Haven, is an avid painter, photographer, and writer. VIDEO: If our story about nautical chart making piqued your interest, you might enjoy this NOAA video of modern mapping techniques. VIDEO: As climate change and melting artic ice leads to more open water, work is under way to map the extended continental shelf in the arctic. VIDEO: Did you race in last summer’s Camden Classics Cup? Watch the video of the inaugural event. The dates for this summer’s racing are July 27-29, 2017. VIDEO: U.S. Sailor Rich Wilson is the oldest sailor in the grueling Vendee Globe Race. Check out this video footage of one of the boats taken from a helicopter. SLIDE SHOW: See more images from this issue’s featured photographer in The Maine I Love, Alex Sanger. LOOKING FOR A BOAT? Or do you just love reading about boats? 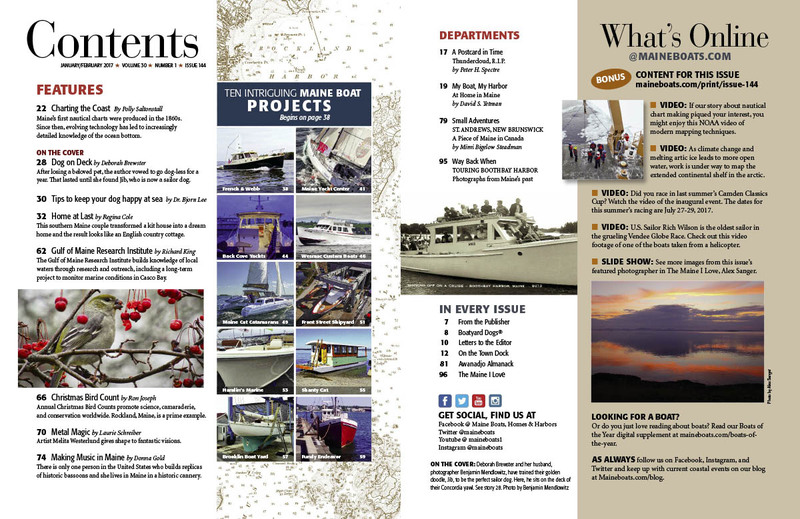 Read our Boats of the Year digital supplement at maineboats.com/boats-of-the-year. As always follow us on Facebook, Instagram, and Twitter and keep up with current coastal events on our blog at Maineboats.com/blog.